Imaging fluorescence in an intact, living brain is difficult due to absorption and scattering of excitation and emission light. 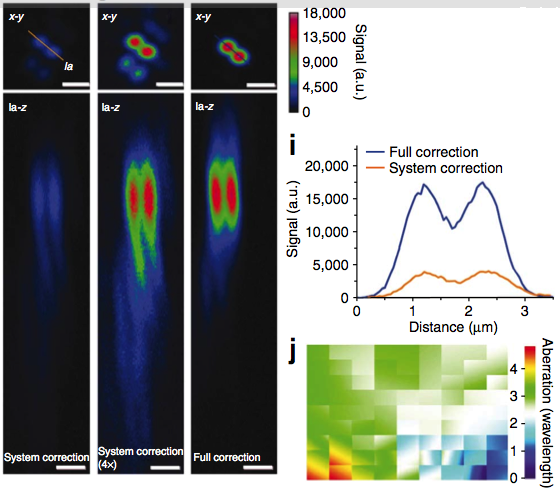 Two photon microscopy uses excitation light in the narrow optical window (700-950nm) where water and hemoglobin do not significantly absorb, which allows structure determination and functional imaging down to depths of ~600nm from the surface of the brain. However, scattering of the excitation light still occurs at these wavelengths, which distorts the excitation volume and causes a rapidly increasing fluorescent background at greater depths. 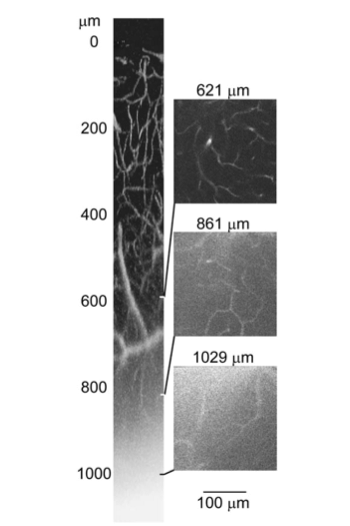 In order to reduce this background and sharpen the two-photon excitation volume, Ji et al in Adaptive optics via pupil segmentation for high-resolution imaging in biological tissues adapt tricks from astronomy (see also Rueckel et al 2006). Depending on where each ray of excitation light enters the brain, the angles of scattering are different. By sequentially illuminating with spatially restricted subsections of full illumination beam, they see how the brain warps the light from each part of the beam. Then they use a flexible mirror and to change the angle and phase of the excitation beam so that each part of the beam comes together in the same place and phase. Since two-photon fluorescence scales as the square of the intensity of the excitation light, this dramatically improves both the resolution and the signal to noise of the fluorescence image. Pre-warping the excitation light to cancel the scattering improves fluorescence localization and intensity. 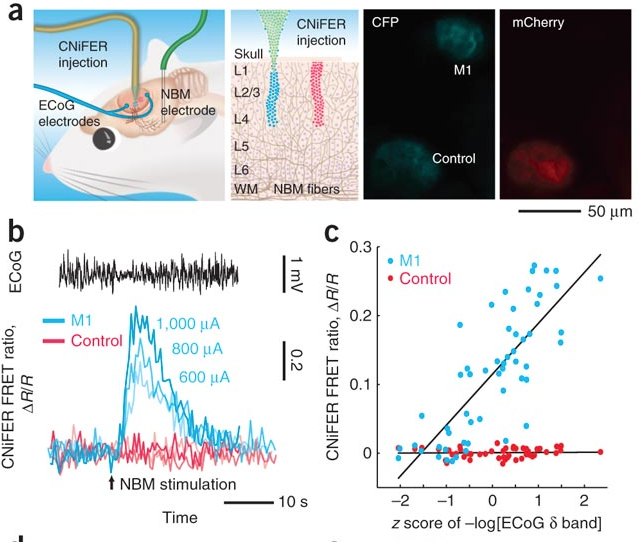 How well will this work in the brain of a living animal? It’s not clear. Large differences in scattering paths across a field of view may dramatically slow the determination of optimal excitation beam warping and make it difficult to scan across a field of view quickly. Motion of the brain may change the pattern of scattering faster than the system can adapt. 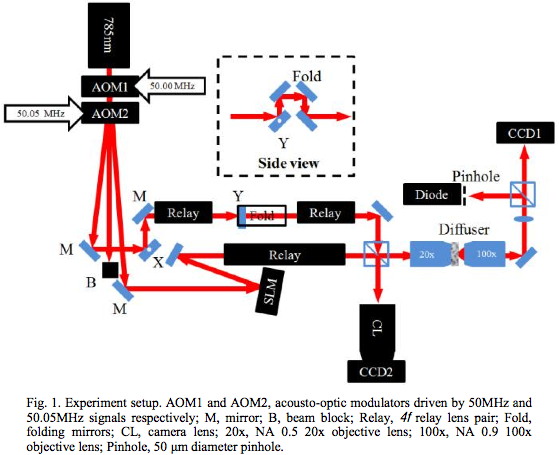 Still, the use of adaptive optics is one of the few promising techniques for increasing penetration depth and signal in optical brain imaging (not counting sucking off the bits of the brain that are “in the way” of the excitation beam.) There are other optical tricks in astronomy that have not yet been mined for neuroscience applications. Hopefully these will one day allow the functional imaging of all layers of the mammalian cortex, not just layer 2/3.